Diagnosing HIV and providing care to sufferers living in isolated areas is never easy. It is even less so when a war raging and health structures are crumbling. 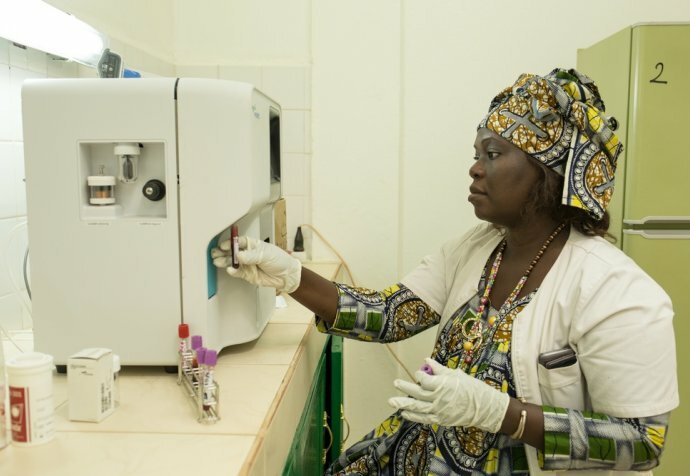 Médecins Sans Frontières launched the pioneering “test and treat” project in Yambio, South Sudan, over a year ago. Its aim is to screen isolated rural communities for the virus and then supply drugs to those found to be HIV positive. Mutinta Milimo is currently the health promotion activity manager and shares her experiences. "The project is located in Western Equatoria province, which borders with the Central African Republic and the Democratic Republic of the Congo. The area is fertile and it rains for about 9 months of the year, making it an important agricultural area. In 2015 fighting erupted between the government forces and local armed groups. At that time many sought shelter in the rural areas outside the towns and villages, in their small holdings known as shambas. In Yambio there is a significant presence of a rural population without access to HIV treatment. South Sudan’s collapsing health service is unable to reach some of the more inaccessible places near Yambio. "It is really important that the local community knows when we are coming so the IEC team (information education and communication) will pass through the designated villages and meet with the elders"
Médecins Sans Frontières is focusing on diagnosing HIV and treating it at community level to address transmission of infection and extending life in unstable areas with a poor health network. Our teams come together and decide on pre-planned routes for the weeks ahead. It is really important that the local community knows when we are coming so the IEC team (information education and communication) will pass through the designated villages and meet with the elders. When one of our five teams arrive in a village, community health workers will pass through and announce our arrival with megaphone. People are generally happy to be screened. The very best days to visit are market days, which are generally on a Saturday or a Sunday, when the local farmers come out to sell their produce. We can see up to 70 cases on these days. Access to isolated communities is challenging as the road network in this area is problematic. During the rainy season, tracks wash away or turn to mud so progress can be difficult. When clashes erupted in the town of Birisi, most of the population fled into the forest near the DRC border. For about one year we had little or no contact with these populations. We were very anxious as many people who were HIV-positive were not getting the lifesaving antiretroviral drugs (ARVs) they needed. The isolation and lack of security of these communities can also cause problems. If an area is inaccessible, a community health worker from the villages will come out to meet us and take back several weeks of supplies for the patients in his or her area. While it is still early days for the project, so far we have tested 10,433 people. Of these, 417 were found to be HIV-positive and 323 are getting treatment. When the trial period comes to an end we will help the South Sudanese Ministry of Health take over parts of the project and continue providing HIV care for the patients we currently provide with ARVs. The lessons learned from the project should have great relevance for those who are HIV-positive and living in a rural setting.